Priorities for easing traffic congestion in Bristol and across the West of England to support economic growth will come under scrutiny at a major conference next week. 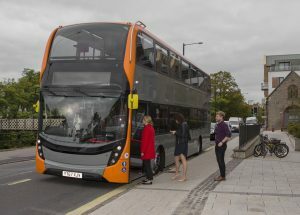 Business West, the region’s largest business representation group and the organisation that runs Bristol Chamber of Commerce, will present the findings of a study among its members which will help shape the debate around the region’s public transport system so that it delivers for the business community. The findings will be presented by Bristol Chamber chief executive James Durie, who will be joined by speakers including Mayor of Bristol Marvin Rees, Bristol Airport planning and sustainability director Simon Earles, First West of England managing director James Freeman, GWR commercial development director Matthew Golton, and West of England Combined Authority director of infrastructure David Carter. First West of England Managing Director James Freeman added: “We have started to make real progress particularly with the arrival of the £230m rapid transit Metrobus service, (pictured), where there is already significant evidence of behavioural change with people leaving their cars behind and taking public transport into and around the city.